Steeped in history, Cypriot handicraft is preserved to this day in government sponsored foundations which are committed to keeping this art form alive. Cyprus Handicraft Centers are open in all towns and most villages proud of their heritage, will have a small museum showing their amazing work with anything from basket weaving, to lace making, tapestries, weaving, pottery, leatherwork and copper and silverware. These arts have been passed down from generation to generation and are still produced to this day. In these modern times it is a great achievement to keep these traditions alive, hundreds of years later. The Cyprus Handicraft Centre has done a lot to keep these traditions alive and if you get the chance to visit them you will be able to purchase beautiful handmade objects and even get to watch some of these items being made. Cyprus was famous for its handicraft even dating back to Alexander the Great whose famous sword was made in Cyprus. The quality of these Cypriot handicrafts throughout the ages are showcased in various archeological museums in Cyprus and abroad. The need for authenticity and the preservation of traditions has led to Cyprus crafts seeing a revival in recent years. The Government of Cyprus with the assistance of various U.N. organizations has created within the Ministry of Commerce, the Handicraft centres whose main aim is to showcase Cyprus handicrafts and preserve them for generations to come. There are certain villages who still have artisans creating fantastic original handicraft. If you go to Lefkara, you will find the most amazing hand embroidered lace, which are referred to as ‘Lefkaritika’, and delicate silver ornaments that are hand carved. Lefkara also has its own Folk museum were you can see beautiful works of art which have become famous in most European countries. It is worth noting that Leonardo Da Vinci travelled to Cyprus in 1481 and purchased an embroidered tablecloth from Lefkara which he gave to the Milan cathedral to use for their Holy Altar. This picturesque village is situated at the foot of the Troodos Mountains, 650m above sea level. 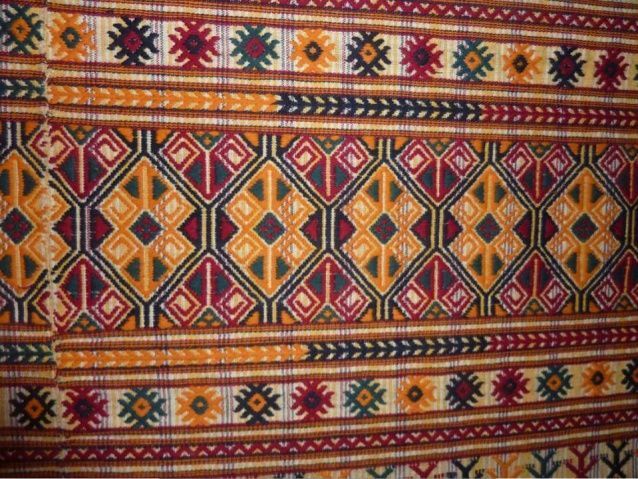 Lefkara embroidery has been included in the UNESCO list of Intangible Cultural Heritage since 2009. The other village which is famous for its weaving is Fyti which is situated in the hills of Paphos, and is a 20 minute drive from Polis. Fyti is situated 680m above sea level and has beautiful views of the surrounding hills and the sea in the distance. According to local folklore Fyti has been in existence since medieval times. The square in the middle of the village boasts two tavernas, and the Fyti museum which hosts a selection of Folklore art which includes the famous, colourful weaved cloths, that are unique, and only made in this village. If you are lucky you might still find pieces of woven table runners to buy. It is interesting to see the traditional weaving machine which was used to create these works of art, and you will find one together with its fully operational spinning wheel at the Fyti museum. These multicoloured textiles are called ‘fythiotika’ and the technique for making these dates back to medieval times. There are many areas in Cyprus that are well known for their handicraft and too many to mention here, but if you are visiting Troulli, Mesogi or Liopetri you will find a lot of basket ware. Basket making is one of the oldest handicrafts in Cyprus and they are still produced in the same way, to this day. Raw materials used in basket weaving include reeds, date palm leaves and hard reeds. The only difference modern baskets have to the old traditional ones are the commercial colours that have been added to make them more colourful. The different shapes and sizes were created for specific reasons, some to carry grapes and olives and others to store and transport crops for domestic use. Palm trees and straw were also used to make a variety of very useful items and the techniques used hundreds of years ago are still practiced today. The round flat ‘tsesti’ which were used to keep bread and for the preparation of many types of food are still used in most homes. These decorative baskets come in all shapes and sizes and are an asset and decoration in any kitchen.